The latest show from Morro and Jasp is a true delight. Morro and Jasp: 9-5, the clown sisters’ latest adventure, finds the duo starting up their own business. The result is a satire of business culture, labour relations and commercialization. But even if Morro and Jasp are clowns complete with red noses, we still care about them as people and the emotions they evoke complements the satire and general foolishness to create an unusually satisfying comedic experience. the money from the investors they hope to repay the loan they took out to buy all the office accoutrements and their business can take off. There is just one little problem – they don’t have a product. To solve this problem, Jasp gives herself the task of writing the promo to give the investors and Morro the task of devising the product. Morro had wanted to be creative, but Jasp had repeatedly proclaimed, “You’re a professional. You’re not supposed to be creative!” But now Jasp has to backtrack on that statement. Annis and Lee are superb physical comedians. Every one of the physical items mentioned above leads to some sort of hilarious stage business. Morro’s simply putting the pencils on Jasp’s slightly slanted desk and trying in vain to keep them from rolling off echoes the famous candy factory scene from I Love Lucy. The most extended comedy surrounding an object has to do with the telephone. The two struggle to record the perfect message only to have an argument greet anyone who phones. Jasp’s attempt to use the phone as an intercom with Jasp is also fraught with innumerable difficulties. her desk is made up of the boxes that Jasp’s office furniture came in. It is sardonic because it demonstrates that workers have to make do with a mockery of the luxuries of upper management. 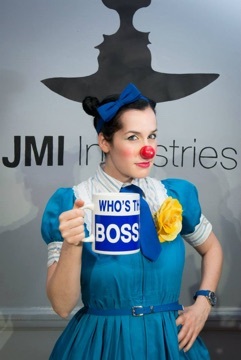 It is successful because, due to the magic of clown, when Morro opens the empty box that held Jasp’s laptop and presses a button, it makes the characteristic Mac startup chime. To invent a product, Morro and Jasp take suggestions from the audience about what characteristics of colour, shape and effect make a product appealing. Morro, in the course of doing other work, has a eureka moment and develops a fairly gross product that still fulfills all the audience requirements that then tests it on selected audience members. Jasp is appalled at what Morro has invented but it turns out the investors are arriving that very day, not in five days as she had thought. How will they get out of this predicament? Well, you have to see the show to find out. And despite all the duo’s ups and downs that have gone before, the ending is sure to leave you with a warm and fuzzy glow. Director and dramaturg Byron Laviolette has shaped the show so that the energy never flags whether that energy comes from physical or verbal comedy or from Morro’s attempts to maintain an emotional, rather than merely professional bond, with Jasp. It isn’t just their perfect timing and instant rapport with the audience that makes these clowns so delightful. 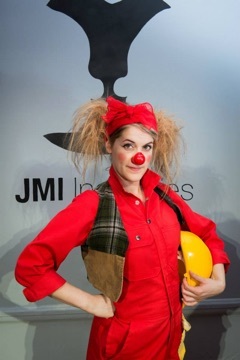 The fun of Morro and Jasp is that their playing at starting a business will remind people in the audience of those times when they played at imitating their parents’ jobs or jobs they saw others do. The genius of Morro and Jasp is how they appeal to that spirit of childhood that we all still carry with us but too often forget we have. The duo so clearly reminds us of the essence of play that their show produces a feeling of joy as well as laughter. I waited far too long to get to know their wonderful way with comedy. Don’t you make the same mistake. Photos: Amy Lee and Heather Marie Annis; Amy Lee as Jasp; Heather Marie Annis as Morro. ©2015 Alex Nirta.